Colorado’s mountain towns are known worldwide as an incredible wintertime paradise for skiers and snowboarders, but in summer, the same high-altitude ski towns become gorgeous playgrounds for hiking, cycling, camping, fishing, boating, golfing, exciting events, great dining, shopping and cultural attractions. Hiking trails, ranging from short, easy loops to long backcountry treks, are in abundance all across the state. These hills aren’t just for those on foot. Several dude and guest ranches offer guided horseback riding tours through beautiful, evergreen- and aspen-laden forests. A corps of cyclists gravitates to the mountain towns each summer, too. Winter Park is a popular place for road biking and Crested Butte for mountain biking (it’s known as the birthplace of the sport). All of the towns have places where you can rent a bike and gear to stay safe and make you look like you’ve been riding these tracks for years, and many of them open their lifts to bikers who want to shoot down the trails they skied down just a few months earlier. Colorado has some of the best mountain golf courses in the world, and they’re also plentiful. Eagle County alone, home to Vail and Beaver Creek, has a dozen courses with jaw-dropping high-altitude views. Best of all, because of the thin air at higher altitude, your ball flies farther than you thought possible. If you’d like to spend a day gliding across crystal-clear waters, rent a motorboat, pontoon or sailboat on Grand Lake near Winter Park or on Lake Dillon in Dillon to enjoy the serene, peak-filled vistas only a mountain lake can offer. Fishing outfitters can set you up with tackle and lessons. They’ll also share where you’ll have the most luck hooking the big one. Or zip down the side of the mountain atop an alpine slide, which can be found in Winter Park, Breckenridge and Durango. 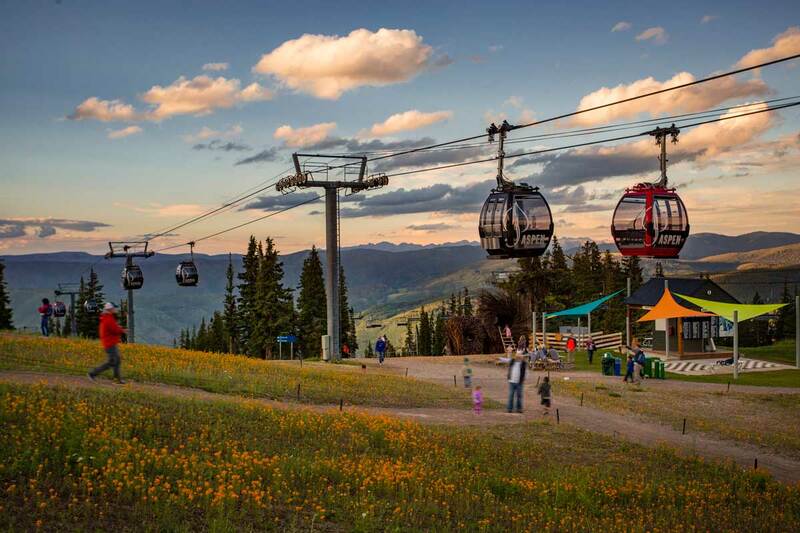 Adventure, relaxation, shopping, dining and entertainment — summertime in Colorado ski towns delivers it all. Colorado’s ski towns aren’t just about communing with nature — there’s plenty for those who prefer less of a workout. The summer months bring dozens of festivals celebrating music, food, art and more. In Aspen and Snowmass, locals and visitors enjoy film, comedy, balloon and wine festivals. Breckenridge always has a packed schedule of events, including an art festival, a huge Independence Day celebration and the Breckenridge Beer Festival. Keystone does quadruple duty with a blues and art festival as well as a bluegrass and beer extravaganza. From a wine festival in Steamboat Springs to a jazz festival in Winter Park to the Telluride Bluegrass Festival, Colorado’s high country promises lively celebrations all summer long. Towns such as Silverton, Durango, Aspen, Breckenridge and Crested Butte have charming, historic downtowns filled with lively restaurants. Mountain dining ranges from casual pubs to high-end steak and sushi houses, and the selection is always growing. And as in the rest of the state, craft breweries are big in ski towns. Visitors can check out four craft breweries in Durango alone, and then there’s the renowned Breckenridge Brewery, Telluride Brewing Co. and many more. As for shopping, ski towns have everything from designer labels to Colorado handicrafts. Look for quaint boutiques in Crested Butte, impressive art galleries in Silverton and western clothing shops in Steamboat Springs. Vail and Aspen, well known for luxury shopping, also boast fantastic outdoor-gear stores, and Keystone’s three villages offer a wide array of jewelry and gift shops. Colorado’s mountains are rich in history, and most ski towns not only have streets lined with well-preserved century-old buildings, but also have wonderful history museums that chronicle the regions’ past. The Durango and Silverton Narrow Gauge Railroad and Museum, the Colorado Ski & Snowboard Museum in Vail and the Tread of Pioneers Museum in Steamboat are just a few places to visit. For more things to do in Colorado in the summer, read 12 Quintessential Summer Festivals in Colorado, Summer Food & Wine Festivals and 8 Ways to Love Summer in Colorado.